Jean is one of those all but invisible yet indispensable people who hold our society together. Five days a week Jean, a licensed nursing assistant, leaves her family's crowded apartment in Paterson and drives to the Greystone state psychiatric hospital in Morris Plains. She spends her working days providing care and compassion to patients. The pay is modest and the challenges high, but where would we be without people like Jean, who care for our most vulnerable citizens? And don't hard-working people like Jean deserve the chance to live in a decent, affordable and safe home of their own? Jean and daughter Vanessa do some painting as part of their sweat-equity. Paterson Habitat thinks so. 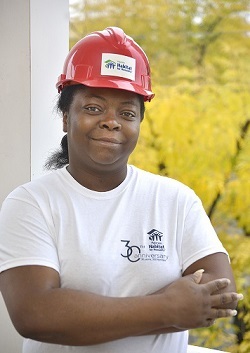 This year Jean, her three daughters, one son, and granddaughter will become a Habitat family. With the help of a low or no-interest Paterson Habitat mortgage, Jean is buying a new home in our 12-block focus area in the 4th Ward. Jean’s after tax income is eaten up by the $1,350 a month she pays for her current apartment in a distressed neighborhood, a familiar story for low-income working people. The monthly mortgage on her Habitat house will be significantly less than her rent and will help her realize a long-held dream.